Could 2018 be the year of the Warning, Consolation, and Miracle? If so, we should hear from some of the visionaries of Garabandal and Medjugorje prior to Good Friday this year (March 30th). Only two moths from today. We'll see. This is also mentioned in a book about Garabandal. 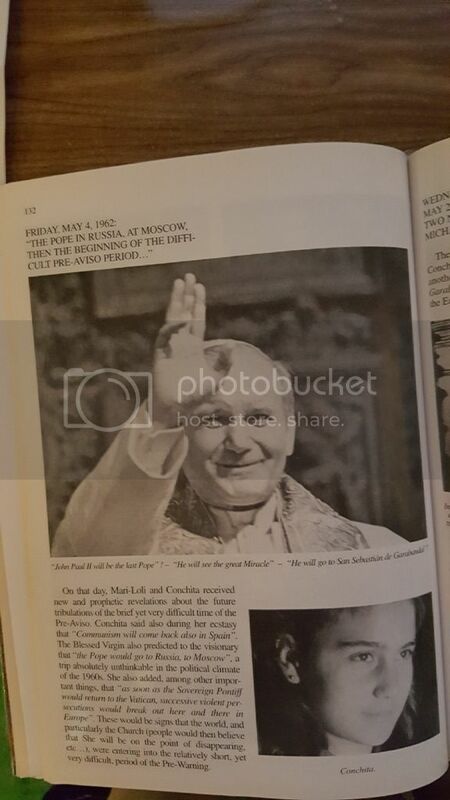 Albrecht Weber’s book (The Finger of God) contains this statement attributed to Conchita: “The Pope will go to Russia, to Moscow. As soon as he returns to the Vatican, hostilities will break out in different parts of Europe.” [The source for this information was also requested. Mr. Weber responded: “Conchita said this in a long conversation at her house on November 14, 1965.”] (A reference to this point also appears in the book Suddenly and Unexpectedly. by T. Michael Fay on page 47) Another reference to this point was found on page 132 in the book “Garabandal” by Jacques Serre. I have a photo of that page but I am not sure how to post it on this forum. On that page it specifically says that this will occur prior to The Warning. 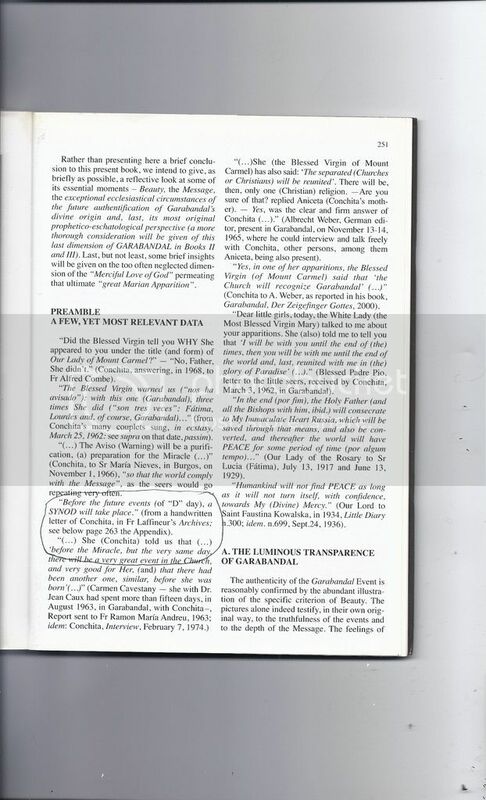 In the book Suddenly and Unexpectedly (by T, Michael Fay) it is asserted on page 86 that Mari Loli (one of the four girls of Garabandal) told some persons that the year of The Warning will be an even numbered year. Last edited by daytonafreak : 12th February 2018 at 04:28 PM. This website allows you to upload pictures to the web. Just make sure the picture does not violate the policies and rules. Interesting, it didn't come up. It worked. Thanks for sharing. Ron, have you or anyone heard from Fr. Petar Ljubicic? If it would be that The Warning is happening on Good Friday, we would get 3 days advance notice. So he would have started his fast already if this is the case. Hey, Sorry, I didn't see your post. Someone just now pointed it out to me. I think, if the Warning is this Good Friday, and if it is the same as the First Secret of Medjugorje, then it should be announced on Tuesday or Wednesday of this week! It seems like an outside chance that it is this year, though. If you have a question, you can always e-mail me or PM me if I don't respond in the discussion group.